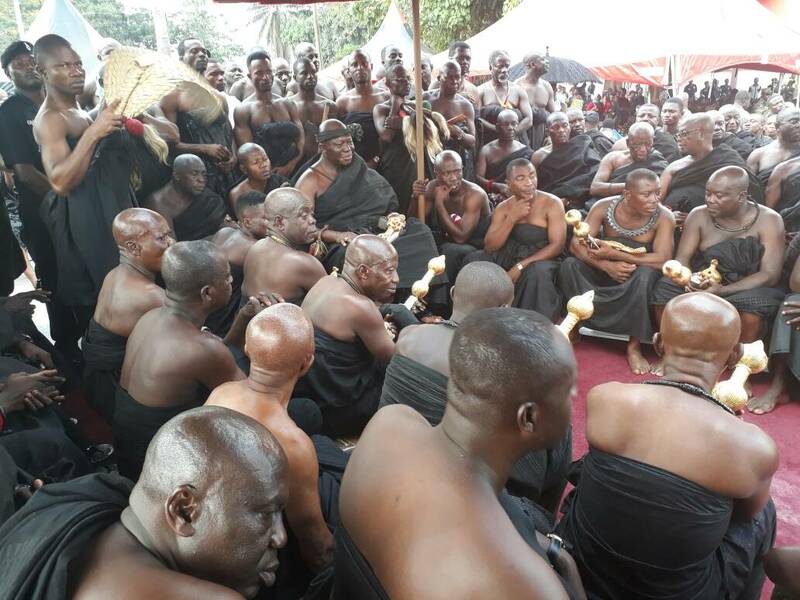 The University of Education Winneba (UEW) has joined thousands of individuals and institutions from all walks of life to mourn with the Asantehene, Otumfuo Osei Tutu II during the on-going final funeral rites of the late Asantehemaa, Nana Afia Kobi Serwaa Ampem II. The elaborate funeral, just fitting for the unparalleled status of the late Asantehemaa (Asante Queen) who passed on, last year at age 109, is scheduled to last for two weeks - December 1 -15, 2017. 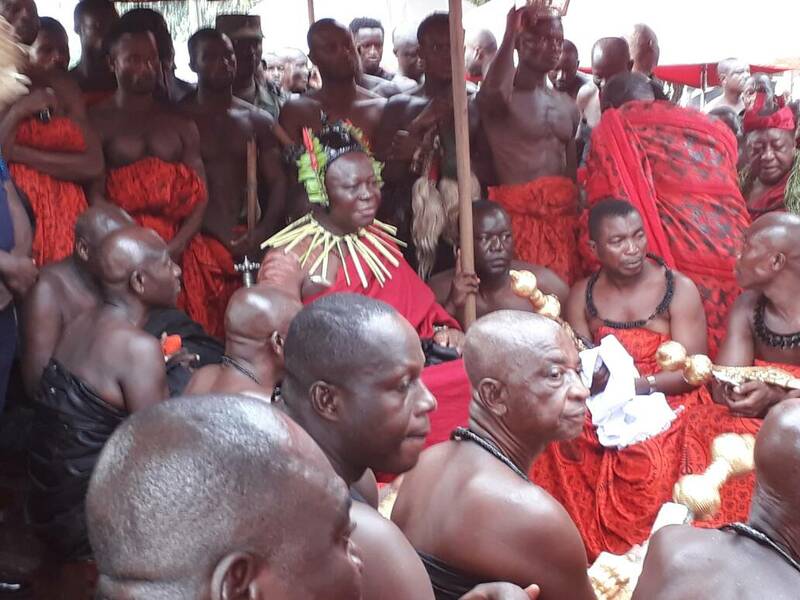 Therefore, to demonstrate its unflinching solidarity with the Asante King and Asanteman, a delegation from the UEW duly called at the Manhyia Palace, last Tuesday, December 12, 2017 to mourn with the Asantehene and in accordance with tradition, presented a cash donation and some bottles of Schnapps to support the funeral. The UEW delegation was led by the Acting College Registrar for the College of Technology Education, Kumasi (COLTEK), Mr. Michael Kofi Twum-Ampomah and also included Mrs. Goddana M. Darko and Mr. Charles Baba Campion, Heads of the Departments of Human Resource and Academic Affairs, respectively. 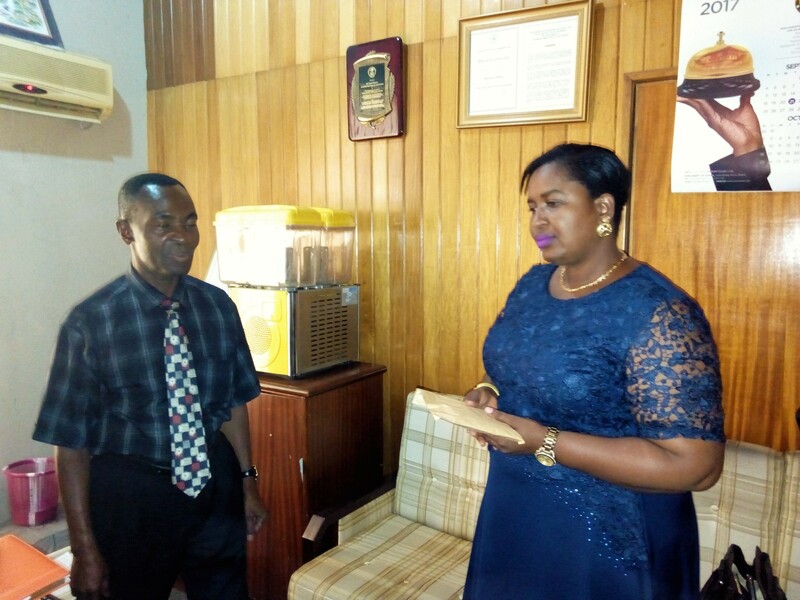 Receiving the donation, the Finance Officer at Manhyia, Bishop Sarpong Oppong thanked the UEW for the contribution assured UEW of Manhyia’s continued collaboration to keep the University on the path of progress. Some of the highlights of the funeral were: Performances of traditional priests and priestesses on December 1, 2017 to ward off evil spirits and smoothen the way for a successful funeral, ‘Adaedwoada’ on December 4, 2017 when there was Ayinan (Traditional wailing), Atrane (Firing of Musketry)and then Asantehene sat in state to distribute palm wine, and receive sympathies as well as December 7, 2017, devoted to the wives of the Princes of the Golden Stool to present their customary burial articles - ADASOA and FUTUO. On Saturday, December 9, 2017 people in the Metropolis were placed under a curfew from 9:00pm – 5:00am the next day, during which the Asantehene and the successor of the late queen, Nana Konadu Yiadom II sent the Abusua Kuruwa to Breman (Royal Mausoleum).